Oxycontin withdrawal occurs when a person who is dependant on OxyContin suddenly stops taking the drug or dramatically reduces their dose. Becoming dependant on OxyContin can happen very quickly and easily. When a person uses OxyContin regularly for a period of just a few days, the body and brain becomes used to the supply of OxyContin and changes in brain and body chemistry occur, adapting to the presence of the drug. Ironically, continuous usage leads to a tolerance so that the individual needs more and more OxyContin through time just to feel normal. 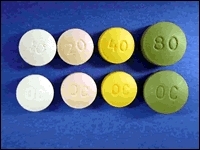 OxyContin withdrawal may begin within 6 to 24 hours of discontinuation of the drug; however, this time frame can fluctuate with the degree of tolerance as well as the amount of the last consumed dose. OxyContin withdrawal will usually peak between 48 and 72 hours after the last dose. Within a week to 10 days, physical withdrawal symptoms should have subsided, although the individual may experience some residual weakness and pain. Although the physical withdrawal symptoms may be over at this point, the brain still needs to re-learn the process of making the endorphins which the user has been substituting with OxyContin. This can take an additional two weeks to two months until the body stabilizes its endorphin production. It is only after restoring this brain chemistry that former addict really feels good, however, he or she will still have a psychological dependency to OxyContin. Oxycontin withdrawal is much the same as the withdrawal from heroin or other opiates. Common OxyContin withdrawal symptoms include: nausea, vomiting, diarrhea, chills, a runny nose, goosebumps, sweating, tears, insomnia, aches and pains in the muscles and joints, extreme restlessness, yawning, abdominal cramps, dilated pupils, and overall flu-like symptoms. Many individuals also experience psychological symptoms including anxiety and depression, with severe cravings for the drug. OxyContin withdrawal can also cause muscle spasms in the legs which causes the person to kick (“kicking the habit”). OxyContin withdrawal symptoms can be extremely uncomfortable but are not life threatening except in very rare circumstances. Attempts to stop using OxyContin can fail simply because OxyContin withdrawal can be overwhelming, causing the addict to use more OxyContin in an attempt to overcome these symptoms. This overpowering addiction can cause the addict to do anything to get OxyContin. On the other hand, psychological cravings can also overcome the former user throwing him or her into relapse. Withdrawing from OxyContin can be painfully intense so it is highly recommended that the person seek care in an OxyContin detox facility where medical professionals can manage and minimize the symptoms associated with OxyContin withdrawal under 24 hour care and supervision. If you or someone you love is experiencing OxyContin withdrawal or having problems with OxyContin abuse, call us now or fill out the form below and we will get back to you to discuss the specifics of your situation and available treatment options for you. OxyContin withdrawal symptoms are felt when the body is physically dependent on the effects of a drug. When the drug is stopped, the body must adjust to the absence of OxyContin. Nerves throughout the body become excessively stimulated without the drug, which causes the symptoms of OxyContin withdrawal. OxyContin withdrawal is not something you want to try to get through on your own. OxyContin Withdrawal should be done with medical supervision. Most OxyContin Withdrawal symptoms are similar to extremely severe "flu" like symptoms. Attempts to stop using OxyContin can fail simply because OxyContin withdrawal can be overwhelming, causing the addict to use more OxyContin in an attempt to overcome these symptoms. OxyContin withdrawal usually lasts about 5 to 10 days, depending on the degree and length of addiction. Intense cravings for OxyContin are usually too powerful to overcome during OxyContin withdrawal which is why OxyContin withdrawal should be supervised by a structured OxyContin detox facility.